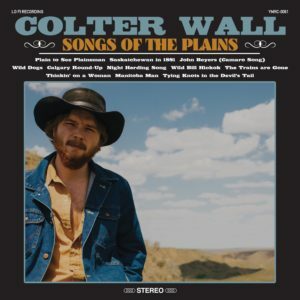 With his deep-baritone voice and songs that transport you to dusty old barrooms, Colter Wall has become one of the most respected country music singer-songwriter’s around these days. His self-titled debut album was met with plenty of praise from critics and fans, leading to extensive tours all over the world. Over here in the UK, Wall has played numerous shows and festivals, gaining him a large fan base. Fans will surely be thrilled to know that he has now announced his sophomore album, Songs from the Plains, which is due for release on 12th October. The 11-song collection features seven tunes written by Wall and was produced by Grammy-award winning producer Dave Cobb (Chris Stapleton, Jason Isbell). With songs such as Wild Bill Hickock and Saskatchewan In 1881, the record promises to be another fantastic dose of old school country harking back to the sounds and stories of the old west. The full track listing and dates for Wall’s upcoming UK shows is below! Songs from the Plains can be pre-ordered here!